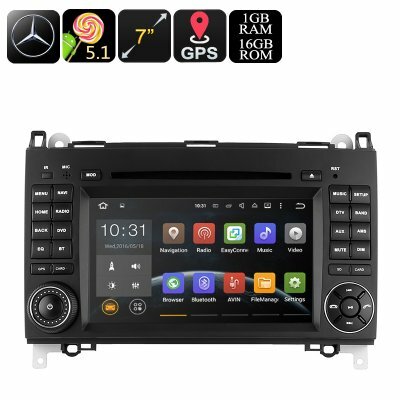 Successfully Added Dual-DIN Car DVD Player For Mercedes-Benz B200 - 7-Inch, Android OS, Quad-Core CPU, 3G & 4G Dongle Support, GPS, Wi-Fi to your Shopping Cart. This 2-Din DVD player for the Mercedes-Benz B200 offers the perfect way to pimp up your ride. Watch movies, listen to music, play games, and enjoy highly accurate GPS services, this Android car entertainment system is sure to meet all your on-the-road-entertainment demands. With this beautiful car DVD player in your vehicle, you can be assured that never again your passengers will be bored while waiting to arrive at your upcoming destination. Offering 16GB of internal storage and 64GB SD-card support, this 2-Din DVD player holds plenty of space for you to store all the latest movies, games, and all other sorts of mobile entertainment to keep your friends and children entertained throughout the ride. Running on an Android 8.0.8 operating system and supporting WiFi, this in-car media system offers so much more than the standard car DVD player. Besides the ability to play regular CDs and DVDs, this entertainment system provides your passengers the possibility to browse the web from the dashboard, play games, and download the latest Android Applications. Packing a sophisticated Quad-Core CPU, this Android media player is capable of handling all sorts of entertainment. Besides WiFi, this car DVD player also supports mobile network through a 3G dongle – providing you with lightning fast internet connectivity no matter where you’re at. Offering highly accurate GPS services, this Dual-DIN DVD player is there to ensure that you’ll never get lost again. Running on Android maps, this navigation system provides you with real-time and accurate traffic data anywhere on the globe – ensuring that you’ll always reach your upcoming destination in the fastest and most efficient manner. From now on you’ll be able to head out on your next holiday with confidence as, with this car GPS system at hand, you’ll never get lost again. Thanks to its Bluetooth connectivity, this car media player can be conveniently synchronized with your smartphone, tablet, or laptop – letting you listen to all your favorite music straight from your mobile music library. Additionally, this 7 Inch Car DVD player also features a built-in microphone through which it allows you to engage in hands-free phone calls – immensely increasing your safety on the road. Whether you use it to entertain your kids, listen to music, engage in calls, or simply to find the fastest route to your upcoming destination – this Android DVD player is the ultimate car accessory that is guaranteed to meet all your demands.